Sandi Morris became just the third female pole vaulter to clear 5.00m indoors or out as she broke the Diamond League record at the AG Insurance Memorial Van Damme before three unsuccessful attempts at a world record height on Friday (September 9). 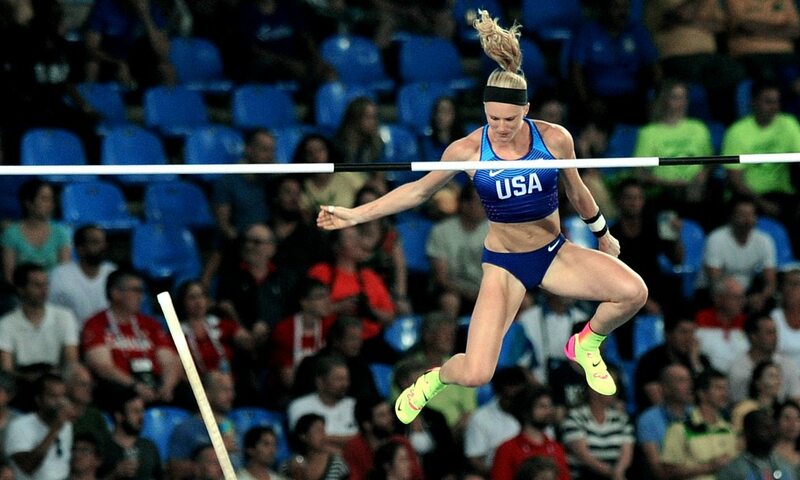 The American has had a rollercoaster year but it ended on a high as Morris, who broke her wrist at a meeting in Ostrava in May, followed up her Olympic silver medal with the world-leading and American outdoor best clearance. The 24-year-old had gone into the competition targeting the meeting record and after achieving that she raised the bar to 5.07m, though it wasn’t to be. Only Russia’s world record-holder Yelena Isinbayeva, whose 11-year-old Diamond League record Morris broke in Brussels, plus USA’s Jenn Suhr have ever gone higher than Morris’ mark. The American’s win turned the tables on Olympic champion Ekaterini Stefanidi as she cleared 4.76m for the runner-up spot but the Greek vaulter’s achievements throughout the rest of the Diamond League series did mean she secured overall victory. “In Rio I was so close to something I really wanted but today I did more than I suspected,” said Morris. “Sometimes you lose, sometimes you win. Another world record attempt had been planned in the women’s 5000m but world 10,000m record-holder and Olympic champion Almaz Ayana did not manage it this time. She still dominated to claim victory in a meeting record-breaking 14:18.89 and also secured the Diamond Race. The Ethiopian has three of the six fastest times in history after clocking her 14:12.59 PB in Rome and she finished clear ahead of Olympic silver medallist Hellen Obiri in Brussels, the Kenyan clocking a 14:25.78 PB. Although Ayana couldn’t improve her own best, she did lead a number of athletes to PBs and as well as Obiri’s lifetime best, Ethiopia’s Senbere Teferi and Etenesh Diro improved to 14:29.82 and 14:33.30 respectively, while Olympic 1500m fourth-placer Shannon Rowbury broke the American record with 14:38.92 for fifth ahead of Kenya’s Alice Aprot with a 14:39.56 PB. Britain’s Eilish McColgan was another to improve as the Briton took almost five seconds off her PB set earlier this year with 15:05.00 to move from 13th to ninth on the UK all-time list. Her fellow Briton Steph Twell clocked 15:14.82 for 17th. Three athletes dipped under 20 seconds in the men’s 200m, one of those being Britain’s Adam Gemili as he took 0.01 off his PB with 19.97 (+0.8) to consolidate his third place position on the UK all-time list. That 19.97 matched the winning time run by Julian Forte but the Jamaican got the nod for victory ahead of the Briton, while Churandy Martina of Netherlands was third in 19.98. France’s Christophe Lemaitre got Olympic bronze ahead of Gemili in Rio despite both athletes running 20.12 but here he placed fourth with 20.16. Gemili’s fellow Briton Danny Talbot was seventh with 20.26. Double Olympic sprint champion Elaine Thompson continued her incredible form this year by equalling the 100m meeting record with 10.72 (+0.6) to match a mark set by her fellow Jamaican Shelly-Ann Fraser-Pryce in 2013. That win ahead of Dafne Schippers’ 10.97 wrapped up Thompson’s Diamond Race win, while Britain’s Desiree Henry placed fourth with 11.12 and finished third overall in the Diamond Race. The men’s high jump was won by USA’s Erik Kynard as he cleared 2.32m for victory and the Diamond Race title on countback ahead of Mutaz Essa Barshim and Britain’s Robbie Grabarz. The women’s non-Diamond League event saw Olympic heptathlon champion Nafissatou Thiam secure success in front of home fans as she cleared 1.93m for the win, while the Borlee brothers were beaten by Dominican Republic’s Luguelin Santos as he ran 45.02 ahead of Jonathan, Dylan and Kevin. Dropping down in distance, South Africa’s Olympic 800m champion Caster Semenya came through with a strong finish to surge over the line and win over 400m, clocking a 50.40 PB ahead of USA’s Courtney Okolo and Jamaica’s Stephenie Ann McPherson, who both clocked 50.51. McPherson got the overall Diamond Race win with 39 points to Natasha Hastings’ 32, the American having finished fifth in Brussels. The men’s 3000m steeplechase was a repeat of the Rio Olympics top three as Kenya’s Conseslus Kipruto beat USA’s Evan Jager 8:03.74 to 8:04.01, while France’s Mahiedine Mekhissi-Benabbad ran 8:08.15 for third. Poland’s world silver medallist Adam Kszczot pipped Kenya’s Kipyegon Bett in the 800m – a strong surge seeing the winner clock 1:44.36 to Bett’s 1:44.44 as world bronze medallist Amel Tuka was third in 1:44.54. Inconsistent pacemaking didn’t help athletes to a quick time in the men’s 1500m and it was Kenya’s Timothy Cheruiyot who claimed the win with a 3:31.34 PB ahead of Morocco’s Abdalaati Iguider with 3:31.40 as Kenya’s world champion Asbel Kiprop clocked 3:31.87 for third to secure the series title. Further down the field Britain’s Charlie Grice clocked 3:38.48. USA’s world bronze medallist Cassandra Tate denied Britain’s Eilidh Doyle the Diamond Race win as she ran a 54.47 season’s best to take the 400m hurdles ahead of Olympic silver medallist Sara Slott Petersen of Denmark with 54.60. Finishing fifth with a time of 55.26 after a strong start, Doyle achieved a total of 40 points for the season but Tate’s win helped her to 50 points for overall victory. Spain’s Olympic silver medallist Orlando Ortega won the 110m hurdles to also secure his series win, clocking 13.08 to Frenchman Pascal Martinot-Lagarde’s 13.12. Britain’s David Omoregie, who ran a 13.24 PB earlier this month in Berlin, finished fifth in 13.43. The women’s non-Diamond League sprint hurdles event was won by USA’s Jasmin Stowers in 12.78. Poland’s two-time Olympic discus silver medallist Piotr Malachowski claimed his fourth Diamond League series win after finishing as runner-up to Sweden’s Daniel Stahl who threw 65.78m to Malachowski’s 65.27m. The men’s long jump was won by South Africa’s Olympic silver medallist Luvo Manyonga with a PB of 8.48m. Another four-time Diamond Race winner was Colombia’s Olympic triple jump champion Caterine Ibarguen as she leapt 14.66m to beat London 2012 gold medallist Olga Rypakova with 14.41m. Madara Palameika won the javelin event and also the Diamond Race following her Latvian record 66.18m to beat Czech Republic’s Rio bronze medallist Barbora Spotakova with 63.78m. Britain’s Elliot Giles ran 1:46.49 to place third in an 800m ‘B’ race won by Kenya’s Willy Kiplimo Tarbei in 1:45.11. Taking place the evening before the main meeting was the women’s shot put competition and that was won by USA’s Olympic champion Michelle Carter with 19.98m from New Zealand’s two-time Olympic champion Valerie Adams with 19.57m, though Adams claimed the Diamond League series win.